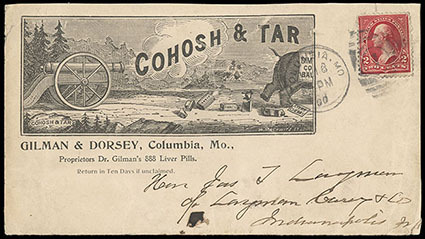 (Medical) Cohosh & Tar, Gilman & Dorset, Columbia, Mo. Proprietors Dr. Gilman's 888 Liver Pills, illustrated ad design showing Cannon Firing at Elephants Hind End, on cover franked with 2¢ red tied by 1900 Columbia, Mo. duplex postmark; missing backflap, otherwise Very Fine. 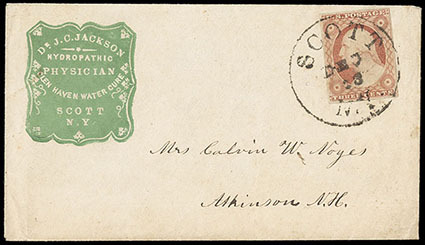 (Medical) Dr. J.C. Jackson, Hydropathic Physician, Scott N.Y., green fancy shield cameo corner card on small cover bearing 3¢ rose (11), four margins, tied by "Scott N.Y. Dec 23" cds to Atkinson N.H., Very Fine. 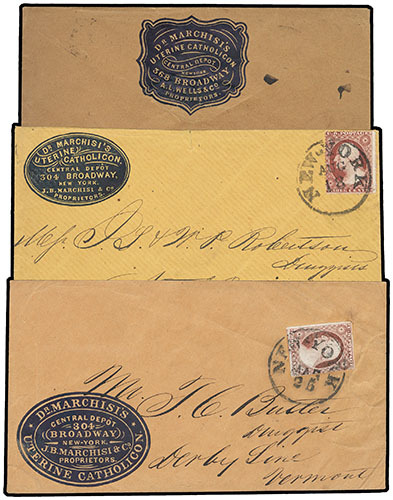 (Medical) Dr. Marchisi's Uterine Catholicon, New York N.Y., group of three different blue cameos comprising #11A with large oval cameo on orange cover #11A four margins with shield cameo on back flap, oval cameo on orange cover bearing #26, Very Fine and exceedingly rare group. 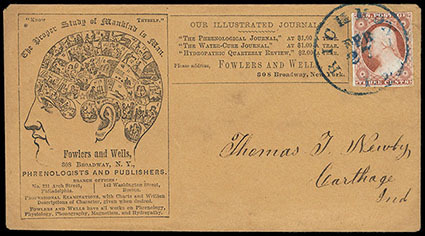 (Medical) Fowlers, Wells, & Co., Phrenologists & Publishers, illustrated ad design on fresh buff cover showing Skull with Partitioned "Brain Organs" bearing 3¢ dull red (11A), bright and fresh with large margins except just clear at top, tied by blue "Richmond Va., Feb 27" cds to Carthage Ind., Very Fine and choice. The foremost American phrenologists, were the Fowler brothers, Lorenzo and Orson, who began reading heads in New York in the 1840s. Joined by Samuel R. Wells (1820-75) in 1844 their publishing industry churned out vast quantities of phrenological periodicals, pamphlets and books. (Medical) Geo. 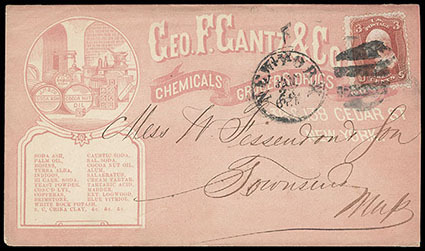 F. Gantz & Co., Chemicals, Grocers, Drugs & c., brown allover shaded ad design on cover showing Merchant Stock Scene, franked with 1867, 3¢ red, F. grill tied by New York cds and grid duplex, Very Fine. Scott No. 94 Estimate $200 - 300. (Medical) Geo. 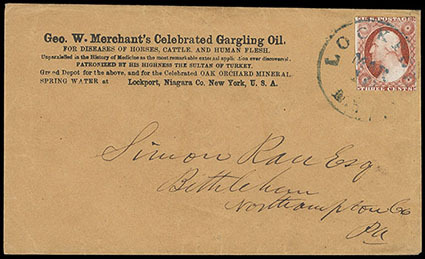 W. Merchant's Celebrated Gargling Oil, Lockport N.Y., group of 6 advertising covers used except one unused stamped reply envelope, range from two #11 uses to a 3¢ Banknote use; some mixed condition, F.-V.F. and scarce group. 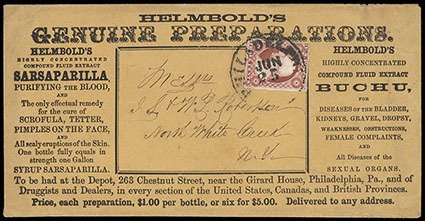 (Medical) Helmbold's Genuine Preparations, Philadelphia Pa., large-size cover with all-oval advertising design on buff cover bearing 3¢ dull red (11), huge margins except slightly in at top left, tied by "Philadelphia Pa., Jun 25" cds to North White Creek N.Y., Very Fine and rare large early medical ad. 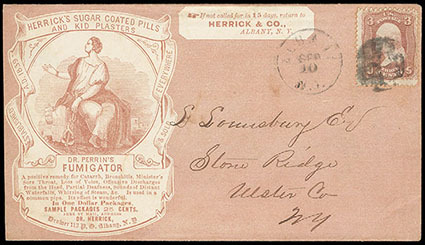 (Medical) Herrick's Sugar Coated Pills and Kid Plasters, Albany N.Y., all-over rose shaded ad design with illustration, on cover bearing 3¢ rose (65) tied by cork cancel duplexed with "Albany N.Y. Sep 10" cds to Stone Ridge N.Y.; missing left back flap, Very Fine and scarce ad. 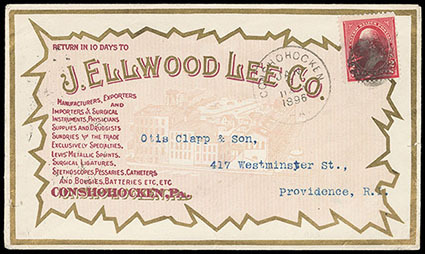 (Medical) J. Ellwood Lee Co., allover multicolored design on cover showing Factory View, franked with 1890 2¢ carmine tied by 1894 Conshohocken, Pa. cds and cork duplex, reverse with red company logo, Very Fine and choice. 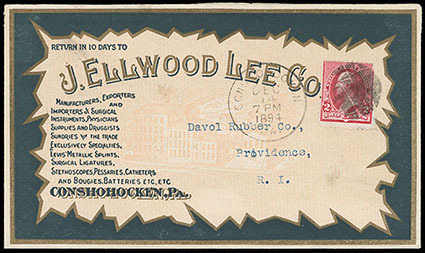 (Medical) J. Ellwood Lee Co., allover multicolored design on cover showing Factory View, franked with 2¢ carmine tied by 1896 Conshohocken, Pa. cds and cork duplex, reverse with red company logo, Very Fine and choice.